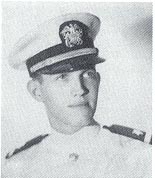 Charles Goebel joined the USNR as a V-12 officer candidate in June 1942 and was commissioned as an ensign, USNR, March 17, 1944, upon completion of Midshipman School at Northwestern University, Chicago. He received additional training at the Optical School, Mare Island Navy Yard. Fulfilling his desire of many years to serve aboard a battleship, he was ordered to report aboard the West Virginia, at that time completing reconstruction at Bremerton Navy Yard. He served as a gunnery officer of the 5" Btry., 7th Div. throughout the remainder of the Wee Vee's commissioned service and participated in the actions at Leyte Gulf, Luzon, Iwo Jima, Okinawa and the peace signing in Tokyo Bay. Released from active duty on Feb. 2, 1946, and returned to school at the University of California (Berkeley) to complete his degree in industrial engineering. Following graduation in 1948, he spent a total of 35 years working for Southern Pacific Transportation Co. He and his wife, Lorraine, have six children, 16 grandchildren and two great grandchildren. Reprinted with permission from USS West Virginia (BB-48) Turner Publishing.